fee-colored in exposed sites with the whole looking like sprays of airy and delicate conifer branches. Growing natively from Oregon south through Baja California, it is, like most pellaeas, difficult in cultivation. Give it porous soil in the lee of nonbasic rocks or experiment with it as a container subject, testing mixtures of assorted soils combined with controlled exposures to a variety of sites. It is for Zones 8 and 9. Pellaea rotundifolia with cascades of green "buttons." 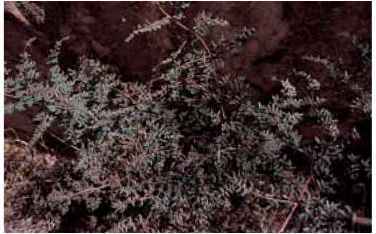 Sprays of blue pinnae on Pellaea andromedifolia in the upper Kern Canyon, Tulare County, California. Photo by David Schwartz. Pellaea brachyptera in a typically exposed montane site in northern California. tivate, but is easy to admire while trekking in the field. It challenges growers in Zones 7 to 9 where it should be offered a lean site with moist but well-draining soil and a daily dose of sunshine. Pellaea breweri, Brewer's cliff brake, is named after William Brewer, a plant collector from California, who along with Sereno Watson and Asa Gray authored the first flora of California. His namesake Pellaea is a small 8-in. (20-cm) evergreen with shiny brown stipes and linear pinnate-pinnatifid blades. The species is unusual in the North American Pellaea population because of its prominent articulation lines breaking at the base of the stipes. The 6 to 10 pairs of bluish pinnae are sessile, looking like attached lopsided butterflies ready to take flight. These are Zone 5 to 9 plants of rocky cliffs from higher elevations in the Pacific Northwest and occasionally found eastward to Colorado. Like other pellaeas it resists cultivation and is most likely to last a season or two in well-drained crevices with a steady exposure to bright light. Pellaea bridgesii (after Thomas Bridges), Bridge's cliff brake, is an evergreen, once-pinnate, 1-ft. (30-cm) cliff dweller with lustrous chestnut stipes and 6 to 12 pairs of stalked, blue-green, round to oblong pinnae. Look for the netted veins that are unusual for the genus (although also present in P. ternifo-lia). 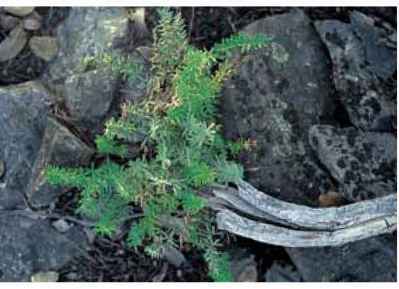 This species is not likely to be found in cultivation, but can be enjoyed in dryland, granitic sites high up in the Cascade Mountains of the Pacific Northwest and eastward to fern-stressed sites in Montana and Colorado. For the home gardener, the usual precautions apply—good drainage, high light, and restricted winter wet. Pellaea cordifolia (heart-shaped leaves) is a Mexican native that barely reaches into a xeric nook or two in the southwest-ernmost arid areas of the United States. It is variously described as deciduous and as evergreen (or not defined at all). Basically, it is especially adapted to Zones 9 and 10. Fronds are usually 18 in. (45 cm) tall with stipes that are a dull wastewater-colored tan-gray. The lax ovate blades are bipinnate to tripinnate with stalked triangular pinnules looking like arrowheads ready to be launched. 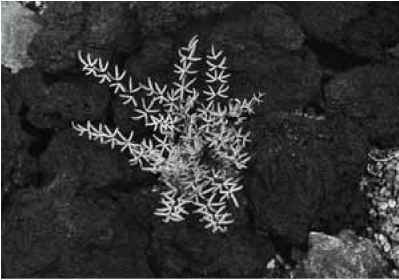 It is botanically significant that the rachis is not zigzagged, thus separating it from the similarly structured P. ovata. This species has been successfully introduced into the custom-designed eco-niche in the gardens of Southern California specialists and is reputed to be easier than most other pellaeas. Pellaea falcata (sickle-shaped) is a 2-ft. (60-cm), rich leathery green species suitable for outdoor ornamentation in Zones 9 and 10 or for indoor décor elsewhere. 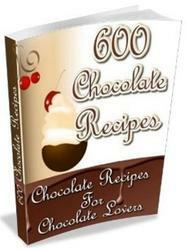 It is native to India and even more common as a slow colonizer in Australia and New Zealand. The linear, once-pinnate fronds are upright with dark, scaly stipes and glowing oblong pinnae that taper to a point. The sori rim the margins but do not reach the pinnae apex. Old stipe bases are persistent and erect like upright straw sentinels, and new growth is occasionally fleetingly tinged with pink. Growers in San Diego, California, report that the species attracts thrips, which can be controlled with a carefully applied mild dose of a nonoil-based insecticide. Otherwise this species is an attractive foil for floral color from greenhouses to tropical gardens. 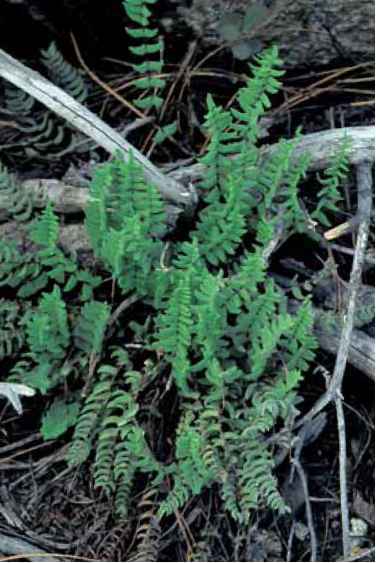 Pellaea mucronata (pointed), bird's foot fern, an apt description, is a spiny 18-in. (45-cm) evergreen with shiny ebony stipes and bipinnate blades with minute glaucous pinnules fanning forth in spreading sets of three. The blade is ovate with the lower pinnae noticeably smaller than the upper complements. All portions feature strongly pointed tips. Botanists have separated this into two subspecies. The species hybridizes with P. bridgesii. In all of its manifestations it is a fern of limestone-free terrain in the Sierra Nevada of California down to Mexico's Baja California. Away from its xeric habitat it is rarely cultivated successfully, but offers promise in gritty compost and brightly lit rock gardens from Zones 7 to 9. Pellaea nitidula (with a shiny surface), synonyms Cheilan-thes nitidula and Mildella nitidula, is a small foot-tall (30-cm) species with mildly hairy but glossy stipes up to two-thirds of the frond length. Lanceolate blades are bipinnate to tripinnate with four or five pairs of pointed pinnae with matching acute-tipped pinnules. The species is very closely related to and may in time be reclassified as Mildella. Populations are at mid to higher altitudes in the Himalayas and China and are candidates for specialized situations in Zones 7 (with luck and dedication) to 10. 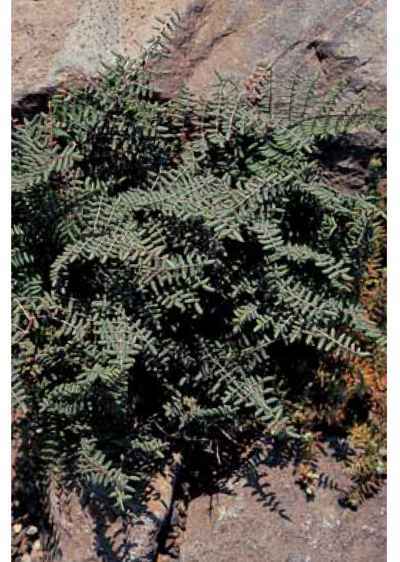 Pellaea ovata (egg-shaped), flexuous cliff brake, is an amalgam of unfernlike characteristics from its rambling loosely lax fronds to the structurally significant zigzagged rachis. It is a tripinnate evergreen up to 21/2 ft. (75 cm) tall with stalked deltas of yellow-green to gray-green pinnules. Soil preferences are on both geological sides of neutral. Widespread populations dot the rocky slopes and piney forests of its native Mexico and extend into Texas as well as South America. It can be introduced into temporarily successful displays, particularly in container culture, in the Zone 8 Greater Seattle, Washington, area, but is better suited to the natural drylands of Zones 9 and 10 in Southern California. Apogamous. Pellaea ternifolia (three-parted foliage) is a typical xeric, growing in exposed drylands from assorted sites in the U.S. Southwest, Mexico, Central America, and the highlands of Hawaii. The 4 to 15 pairs of pinnae bear clusters of three short splayed sessile pinnules. 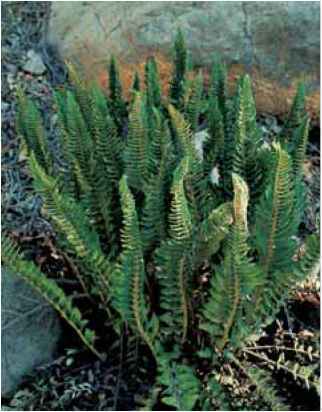 The evergreen fronds are just under 1 ft. (30 cm) tall with glossy, plum-brown stipes and narrow, once-pinnate dull bluish blades. Like P. bridgesii, this species has netted (reticulate) veins—unusual for the genus. It has been in cultivation in sheltered sites in Britain and exposed sites in California, but remains a challenge. Good drainage with requisite porous soil and an alpinelike exposure help to maintain this species in cultivation. It is still not notoriously long-lived away from its preferred existence as a rock climber in igneous substrates. Flora of North America (1993) recognizes three subspecies: subsp. villosa (now designated as a species by some botanists), subsp. ternifolia, and subsp. ari-zonica. Horticulturally, however, all share the same cultural requirements with their attendant rewards and stresses. Pellaea mucronata in the University of California Botanical Garden at Berkeley. 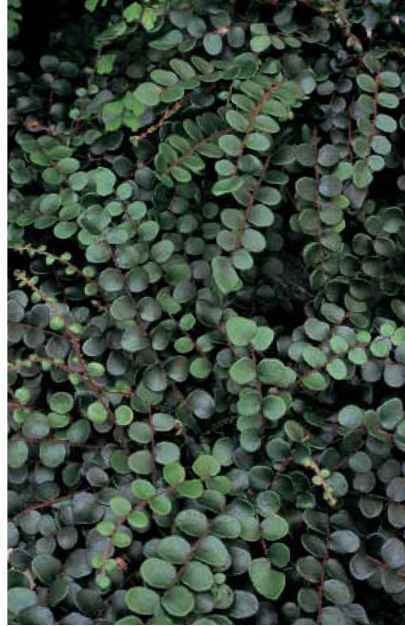 and glowing green foliage usually mature at 2 ft. (60 cm). Reported in Palmer (2003) and Burrows (1990) to be Cheilanthes viridis, it is by all accounts a variable species. A dryish site with superb drainage encourages successful cultivation. Apogamous. Pellaea wrightiana (after Wright), Wright's cliff brake, is similar to and often classified under P. ternifolia. The foot-tall (30-cm) fronds with bipinnate blades grow in acid to slightly basic soil in the lower Rocky Mountain heartland of the United States from Oklahoma and Texas west and north to Utah, Colorado, New Mexico, and Arizona as well as northern Mexico.